The food: When the temperatures drop, I often fire up the slow cooker and make warm and hearty chili. Although I really like spicy red chili, sometimes I want something milder. 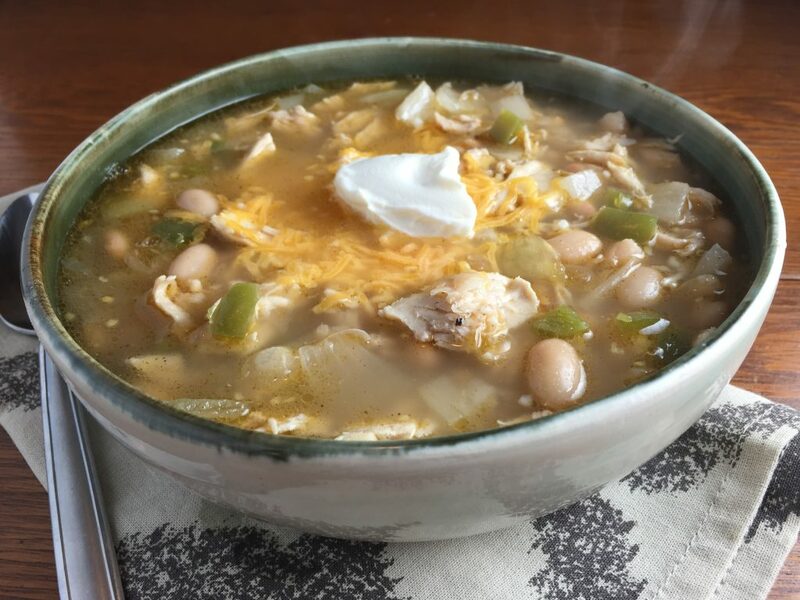 On those days, chicken chili fits the bill. 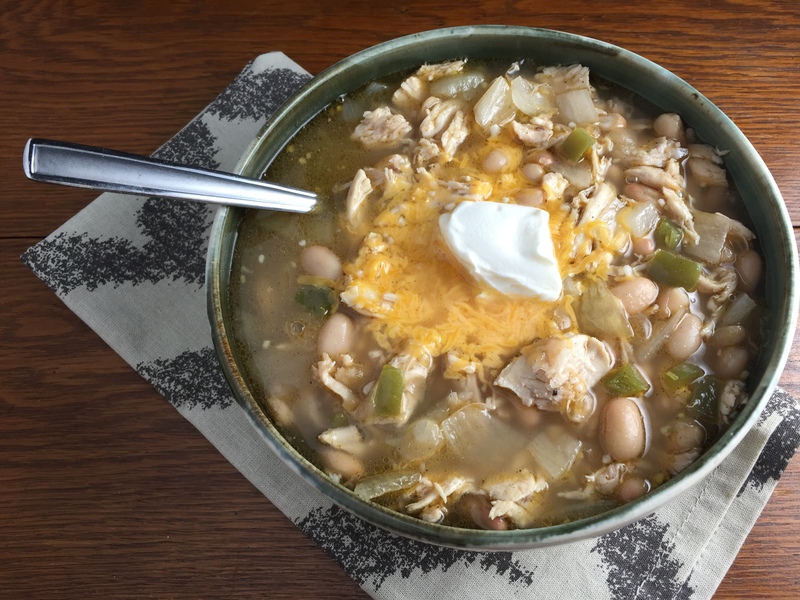 There’s still plenty of kick in this stew, thanks to the chili powder and jalapeño, but the chicken, white beans, and broth are a little easier on the stomach than beef, red beans, and tomatoes. The music: Easygoing comfort food goes best with easygoing comfort rock. 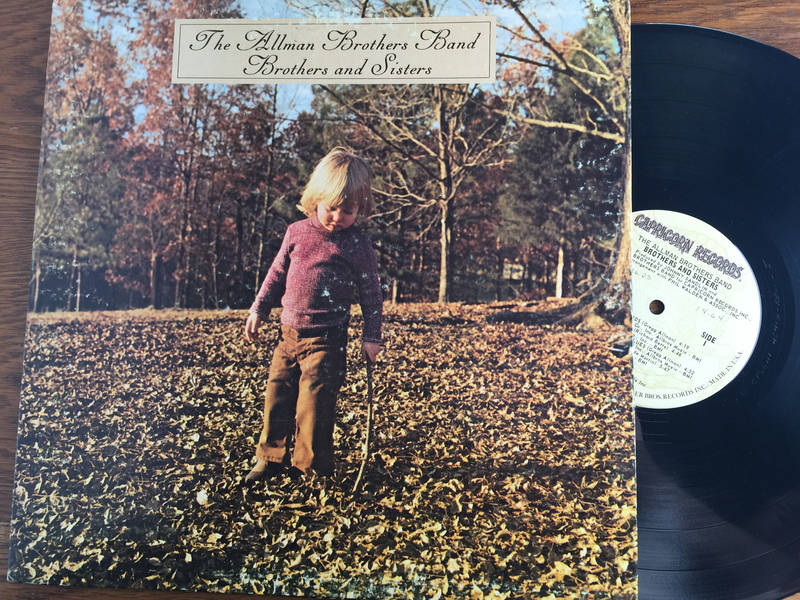 The Allman Brothers Band were the Founding Fathers of Southern rock, a sound that is equal parts country, blues, and rock-n-roll. “Brothers and Sisters” is their fourth studio album, coming out in 1973, hot on the heels of their mega successful “Eat a Peach” album, and following the deaths of key band members Duane Allman and Berry Oakley. Recorded on the historic Capricorn Sound Studios label (this NPR story offers a quick history on the studio), the album includes the band’s only big single, “Ramblin’ Man.” These guys like to jam, so there are only seven songs on the album, but it’s perfect for sitting down and relaxing on a cold day with chili. Just like this worn 70s album, chili gets better with age. What you see in these photos is the chili right after it cooked for 4 hours. It was darn tasty then, but it gets thicker and more flavorful the longer it sits. Also, mashing half of the beans before cooking the chili is a neat little trick for thickening up the stew. Need more ideas for shredded chicken? Try my recipe for Baked Chicken Quesadilla, too. Heat oil in skillet over medium-high heat. Add chicken. As it cooks, use a fork to shred the meat. Add chili powder. Cook until browned. Add onion and pepper; cook until tender. Transfer to slow cooker. Mash half of the beans in a small bowl. Add mashed beans, along with remaining beans and broth, to slow cooker. Cook on low for 4 hours. This is a great soup to warm up with!! It is freezing here! I am definitely a chicken chili fan…we make it quite often here. I’m always up for trying a new recipe too! Thanks for sharing this one at Foodie Fridays! This recipe looks and sounds amazing! During the winter months we have soup at least twice a week so I’m always looking for something different. Thanks for sharing with Creative Spark Link Party. I hope you can join us again this week, the party is live today.